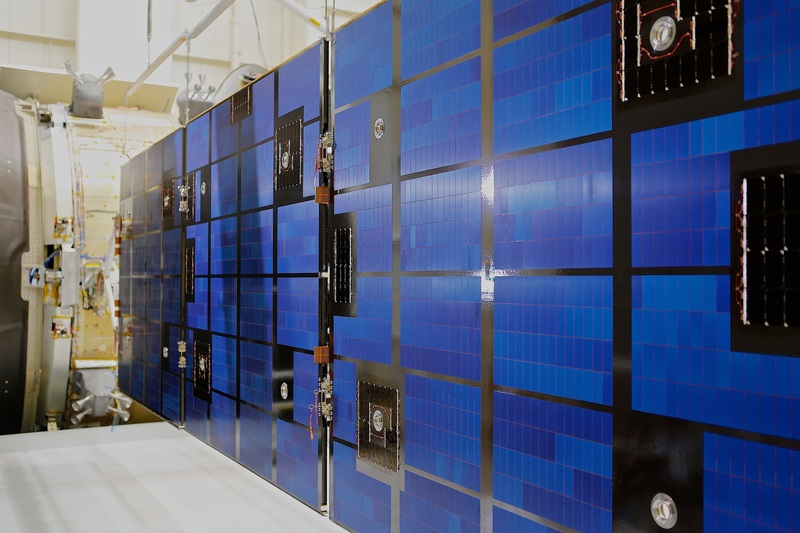 Last week saw the arrival of the Solar Array Wings at NASA’s Kennedy Space Center in Florida, USA, the last major parts from Europe to complete the integration of the European Service Module. 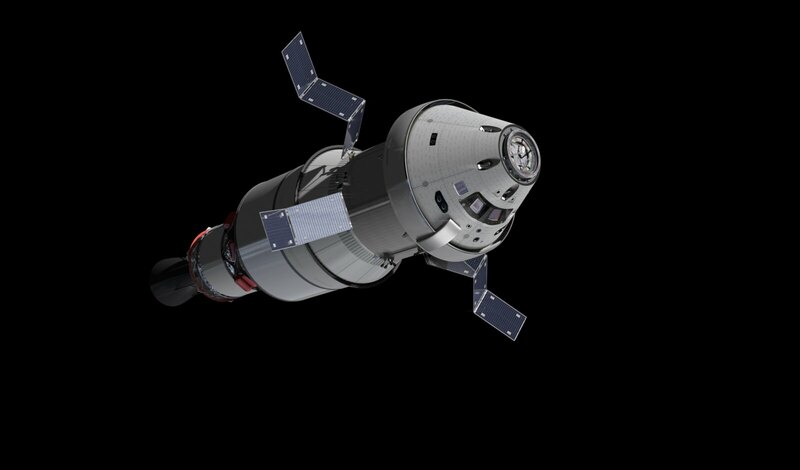 Orion will have four solar wings measuring 7 m in total. The solar wings were shipped from an Airbus facility in Leiden, The Netherlands by aircraft to Miami airport and on to the Kennedy Space Center. 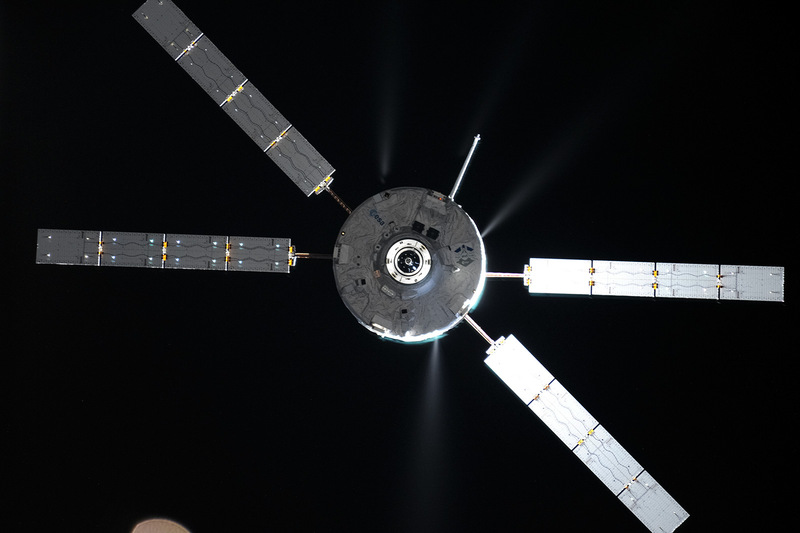 Since our last update the European Service Module has undergone functional propulsion tests. The “functional” aspect means that the avionics and software were tested without actually firing up the engines. Thermal cycling test, including various functional tests, will start this week. The nozzle of the main OMS-E engine is being installed at the end of March and its movement tested during the gimbal test a few weeks later. The Solar Array Wings will be installed around the same time. 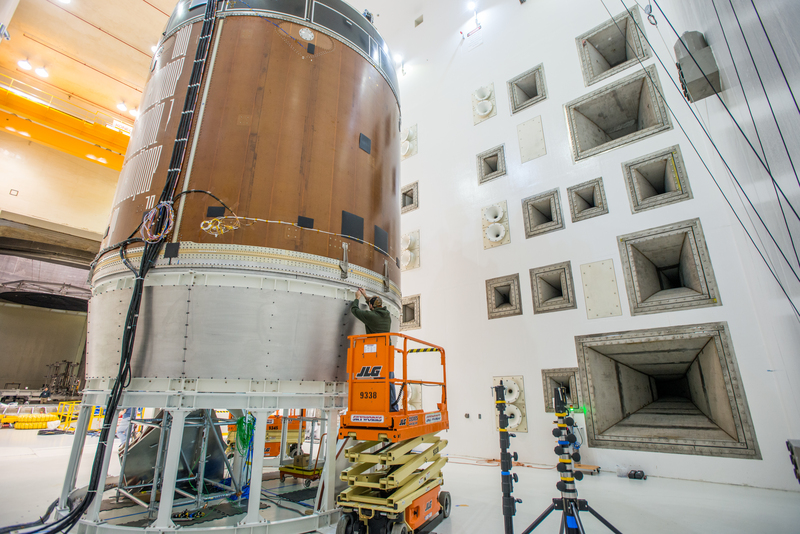 With everything installed, the European Service Module and Crew Module Adapter will go for a direct-field acoustic testing (D-FAT) session where it will be subjected to the extreme noises of a simulated rocket launch. Every rocket that lifts a spacecraft into orbit produces vibrations and loud noise that will shake the spacecraft. 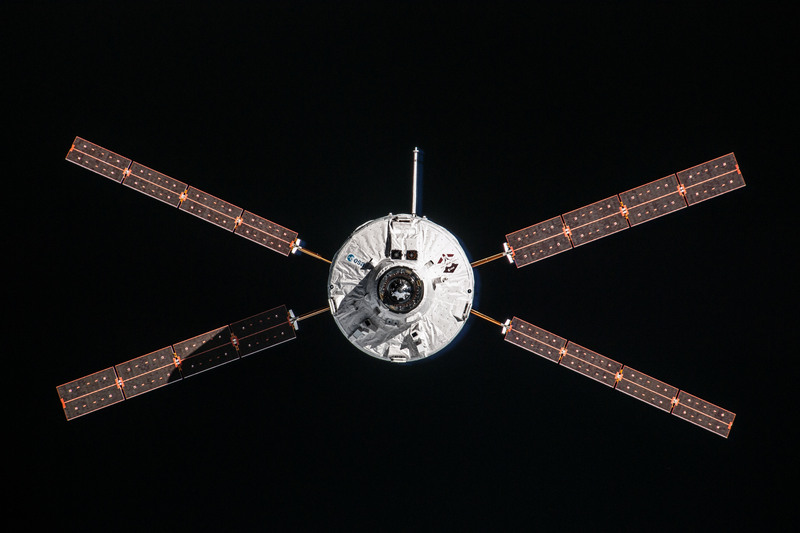 The D-FAT is a more mobile version of the larger acoustic chambers that are used to check spacecraft will survive a launch. In essence the European Service Module will be surrounded by large speakers and technicians will turn up the volume to the sound levels that occur at launch. The Service Module Test Article already underwent this type of D-FAT test and the more traditional acoustic test in the chamber at NASA’s dedicated facility at Plumbrook in Ohio, USA, in 2016. As work continues at a fast pace in the USA, the second European Service Module is already being assembled in the Airbus integration hall in Bremen, Germany. The first parts of the Thermal Control System and Consumable Storage System are being installed, mainly the subassemblies and cold plates for the radiators. These parts will provide a safe and cozy temperature for the astronauts as well as air to breathe and water to drink. In parallel the thruster frames are being installed for the Reaction Control System and the auxiliary thrusters. 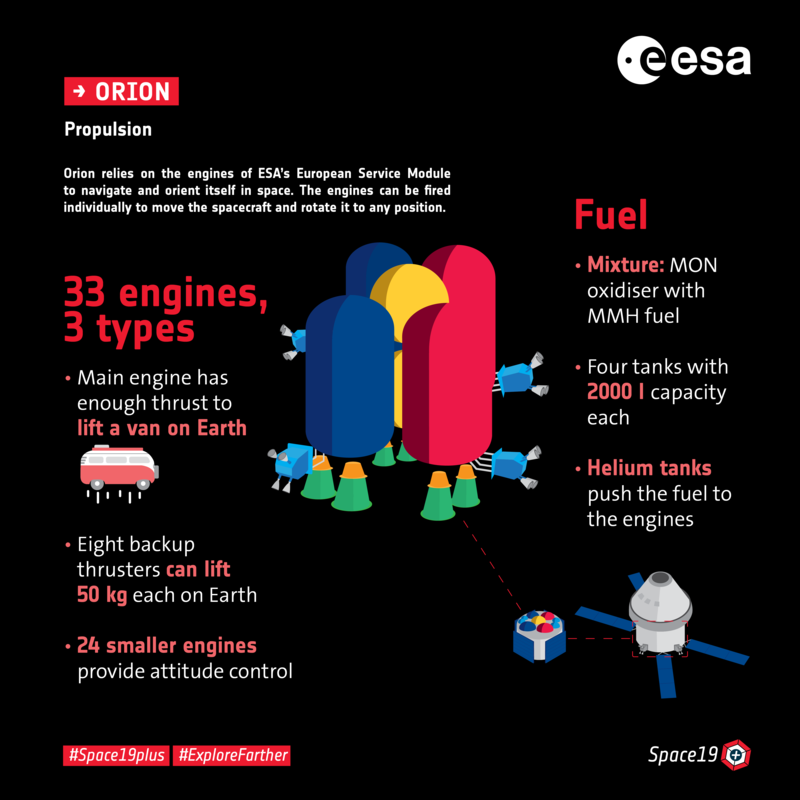 Besides its main engine the Orion spacecraft uses 24 smaller thrusters for attitude control grouped in six pods of four, as well as eight auxiliary thrusters. Over in New Mexico, USA, the Propulsion Qualification Model is gearing up for another series of thruster firing tests. This test model is used to ensure the engines fire as needed and test the system as they are “hot-fired”. 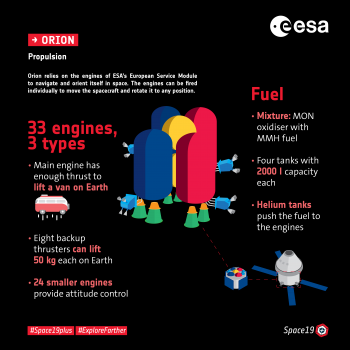 The main engine and auxiliary engines have been tested and in April the Reaction Control Systems will be fired up.